Camp d'action biblique | Richmond, Quebec. Read our 2015 Spring Newsletter. Our 2015 Spring Newsletter is here! 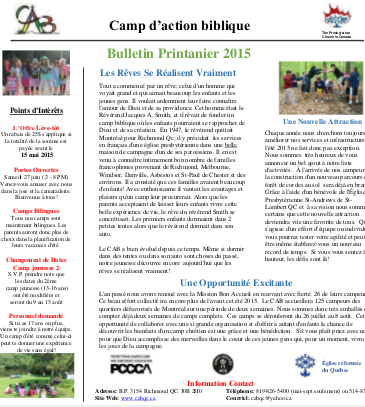 In this issue, find out how the Camp d’action biblique had started (almost 70 years ago) in the article Dreams Do Come True. While A New Attraction talks about the great addition to our list of activities for this summer. And finally, the Camp Committee members are proud to share with you A Wonderful Oppotrunity — one of many creative ways God is making wonderful things through our partnership with other organizations and communities.